Three things have drawn me repeatedly to the red rock landscape around the small north-central Arizona city of Sedona. First, and most obvious, is the landscape itself, which counts among the most distinctive and stunningly beautiful in the world. Second is the set of processes that landscape has set in motion in the conditions of late capitalist modernity — specifically, these include the recreational and spiritual impulse among those who visit it, with earth- or land-based spirituality being a crucial part of that; the voracious appetite of the tourism and real estate industries, which have dominated politics in the city for decades; and the various conflicts these have set the town up for. It is this concatenation of forces that were the primary focus of my book Claiming Sacred Ground: Pilgrims and Politics at Glastonbury and Sedona (and see update here). The third thing that’s continued to attract me to the area is something that only became apparent to me after I’d started studying the place. It is the complex array of management practices and governance mechanisms that shape people’s relationship to land in the red rock region. The US Forest Service is central to many of these, but there are also other interesting urban and ex-urban political processes, mixed in with the efforts of various groups and organizations to change things in one way or another. One of the more recent of these has been the project of turning the entire area into a national monument — the Sedona Verde Valley Red Rock National Monument — the hope being that President Obama, in the waning months of his presidency, could do that by administrative fiat (as has been done several times before by outgoing presidents). Planning this, my third visit to the region since my book came out, I was anticipating that the national monument debate may be a lively one right around this time. Alas, the results of the federal election — with the Democrats wiped out of power in the presidency, congress, and senate — have left Obama more of a lame duck than most of us could have imagined just a few months ago. 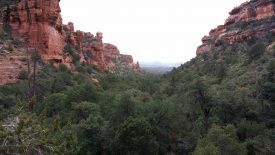 And last year’s 6-1 vote by Sedona City Council not to pursue National Monument status has left the idea dangling amidst its supporters. 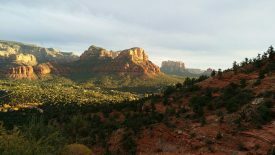 Those supporters, led by the organization Keep Sedona Beautiful, continue to advocate for it. Others continue to vigorously oppose the plan. What has changed in the years since I wrote Claiming Sacred Ground? On the surface, all of the things I wrote about then — the environmental and social history of the region, the phenomenology of the landscape itself, the “metaphysical community” with its distinctive beliefs and “place-practices,” and the political forces at play (with the dominance of the real estate industry, but also a strong conservationist alliance) — are still very much in evidence, and the tangle of tensions and forces is not that much different today, aside from some details that could be updated. Commerce, with the often tasteless development it encourages, has continued to grow in the city, which has become even more marked by wealth than in the 1990s. Much of Sedona is now, at first glance, both a gaudy tourist trap and an upscale shopping mecca, in stark contrast to the rest of northern Arizona. But all of that remains dwarfed by the landscape itself, at least if you have time to explore it. There are hundreds of fabulous hikes to be had, and dozens of places for rock climbers and mountain bikers to go (legally or not). There are still all the usual tensions between these uses and the ecological goals that the Forest Service keeps in play as part of their “multiple use” management ethos. The role of that Forest Service has become even more obvious, especially with the opening of an impressive new Visitor Center in 2010. There is still the motley crew of visitors — over three million a year, from wealthy shoppers to the simply curious, and from two-wheel virtuosos and rock climbers to strung-out seekers looking for a shot of “earth energy” to set them back in alignment with their higher nature. And the town continues to pursue community planning processes much more ambitiously than what you’d find in a typical town of 10,000. One of the things I sometimes get asked by people who’ve heard about my book (but not read it closely) or who’ve heard me interviewed on the topic (by Krista Tippett, among others), is: What do I really think about the “vortexes,” those famous “energy centers” that supposedly dot the landscape in and around Sedona? Do I believe they exist? Bracketing aside any skeptical snickering from scholars or scientists (a kind of bracketing that is essential to the ethnographic work I’ve done here), I would respond as follows. If by “vortexes” you mean a handful of sites — such as those indicated on the vortex maps you can get at the Chamber of Commerce or at particular hotels and resorts in the area — where there are some unusual “energetic” phenomena, something to do with electromagnetism or something more mysterious (“interdimensional” energies and the like), then I would say: no, not really. This idea of vortexes has mainly been a way of attracting visitors of a certain kind (by making claims about the landscape) and then directing those visitors to some places as opposed to others. But if by “vortexes” you mean places where one could sense, perceive, or otherwise experience unusual phenomena that are not easily describable in everyday language, then I would say yes, there may well be such places all around Sedona. There are two things that complicate the matter. One is that these experiences depend at least as much on one’s state of mind, hopes and expectations, and activities as they do on the features of the site in question. The second is that it makes more sense to call the entire red rock area a “vortex” than to speak of specific sites within it as such. When one is in Sedona, it’s almost impossible to avoid the sense that the landscape looms over you, that its redness infuses you and even “charges you up,” and that its rock formations stand over you like mysterious sentinels beaming some kind of messages up to the sky. When you leave, all of that goes away (though it lingers in your memories). All that aside, there are places where, when one approaches them with the kind of “intuitive openness” that the vortex industry asks you to bring, one could certainly have particular kinds of experiences. There are spots that require some effort to get to (including climbing) and that reward you with a wide and elevated view of the landscape. These are the “ah!” places, which in the local literature are called “positive,” “uplift,” or “masculine” energy vortexes. And there are spots that feel more “embracing,” like the Earth taking you in and giving you a space for reflection — not so much on the world as on yourself. These are the “ooo” or “mmm” places, which in the local lingo are “negative,” “downflow,” or “feminine” vortexes. And there are some (like Cathedral Rock, or some of the canyons) that combine features of both. So, if you’re planning to visit Sedona and are looking for that kind of thing: seek and you shall find. That’s not to credit those who go around giving expensive talks on the “science” of the vortexes (say, the “MIT brain scientist” whose bachelor’s degree from that school supposedly included courses in “physics, biomedical chemistry, and brain science”… as if that lends some kind of expertise). But it is to suggest that going out and opening your senses to the landscape, especially in places where it’s still not fully humanized, is a good thing to do, at least if we follow reasonable rules that would keep visitor numbers and impacts manageable. There are, after all, all kinds of other things going on out there, too: like bobcats, mule deer, javalinas, rattlers, coyotes, bears, ravens and peregrine falcons, and at least a half-dozen distinct ecological zones, from high desert to lush riparian. That’s where the Forest Service, and community planning, and all of the rest comes in. The top photo, above, shows part of the town barely visible amidst the rust colored rock formations. The second is the view from the back of Fay Canyon, southwest of town. Photos are mine. Click on them, and then again, to enlarge. It is a day reserved specifically to pay homage to the dead soldiers as well as those gentlemen that served the country with all their might by being in the army forces.